HTET Result 2017 for Level 1, Level 2, and Level 3 will be announced at htet.nic.in. The result for HTET 2017 for all the levels will be announced by the Board of Secondary Education of Haryana. To check the result, the candidate shall have to enter details such as Registration Number, Roll Number, Password, etc. The result will indicate the marks obtained and status of whether the candidate has qualified or not. In order to the qualify the test, the candidate will have to score minimum qualifying marks. Those who will obtain marks equal to or more than the cut off marks will be awarded the Certificate. The qualifiers of HTET 2017 will be issued the HTET qualifying certificate which shall be valid for a period of five years from the date of issue of the certificate. On the basis of HTET Answer Key 2017, Result will be declared for Level 1, Level 2, and Level 3 exam. Also, a separate certificate shall be awarded to those candidates who appear and qualify for more than one level. Check more details regarding the HTET Result 2017 in the page below. How to check HTET Results? Similar to the procedure of downloading admit cards, the method of checking result of HTET 2017 shall be same. Candidates must have the login credentials such as Roll number, Date of birth to log in and know the score obtained in HBSE HTET Result 2017, and status of having qualified the exam. 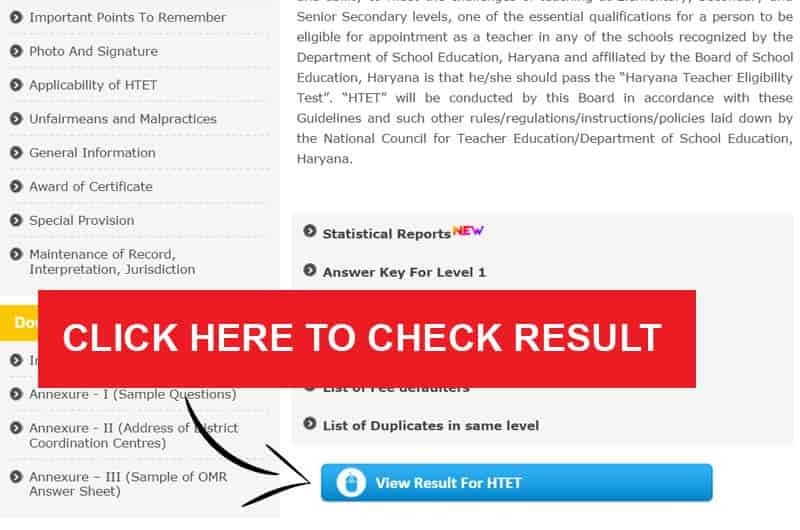 The steps to check HTET 2017 Result are as follows. Step 1 – Click on the link which will be given on this page to check the result or go to the official website of Haryana Teacher Eligibility Test, htet.nic.in. Step 2 – Click on the link “View result for HTET”. Once this link is clicked, a page similar to the one shown below shall be displayed. Enter the details asked in the form – roll number, date of birth, level, security pin (displayed on the page) – to log in and check result. The minimum qualifying marks that the candidate must obtain to qualify it is referred to as cut off marks. The candidate need to obtain marks equal to or more than the cutoff marks in order to qualify the test. After the Haryana Teacher Eligibility Test, the Haryana Board of School Education releases statistics. The statistics indicate the number of candidates who have appeared from each category, number of candidates qualified, and percentage of candidates qualified. The statistics of HBSE HTET Result 2015 will be updated here once the results are announced. HTET 2013-2014 statistics, of Haryana Teacher Eligibility Test held in Feb 2014 were as follows.